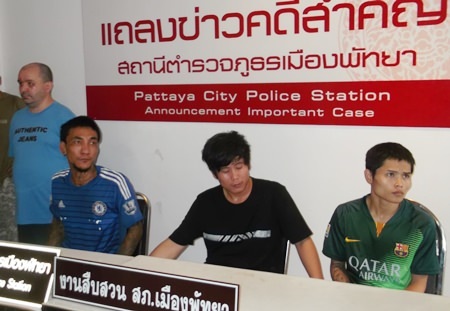 Three beachfront thugs were arrested for two separate attacks on foreign tourists in Pattaya. Katawut Padpao, 27, was apprehended for allegedly assaulting Frenchman Jorge Vieira, 37, on Pattaya Beach around 2 a.m. June 22. Katawut told police he, in fact, was the victim and that he had been chased down and beat up by the French national. Police didn’t believe him. An hour later, Saharat Chaipratet, 20, and Chaimongkol Sampersri, 21, were arrested for allegedly beating Indian Jagdeep Singh, 24, with a metal bar outside the Mixx discotheque near Bali Hai Pier. Katawut Padpao, Saharat Chaipratet, and Chaimongkol Sampersri have been charged with assault for their attacks on tourists. Police said the two confessed to the assault, saying they, with some friends, had got into a fight with the victim and his Indian friends. They were outnumbered, so they fled. But one found the steel bar, so they came back and hit Singh in the head with it. All were charged with assault.